The Property of J.E. de Visser, Hoorn. The arms are those of the Dutch family De Jonge, who ordered a large dinner service with their coat-of-arms. Several exceptional pieces in this service are known, such as cruets on a stand, candlesticks, oblong salt cellars and monteiths. The striking monteiths, or wine-coolers, were filled with ice-cold water to cool wine-glasses and decanters, which were put in the indentations along the upper edge. 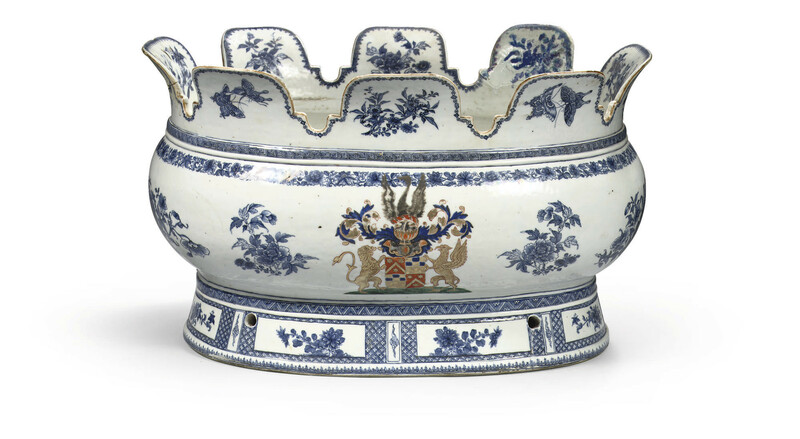 For a discussion of porcelain with these coat-of-arms see Dr. J. Kroes, Chinese Armorial Porcelain for the Dutch market, Zwolle, 2007, pp. 198-199.